You may have noticed over the past couple of days that many of the writers at Tru School Sports have been doing stories on the origin and histories of different professional sports teams’ uniforms. Essentially the writers have been providing an oral history on their favorite teams’ jerseys. Well The Informer wanted to join in the reindeer games, but unfortunately he does not have a favorite team because he does not like teams, he likes individuals. For example, the last fifteen years The Informer’s favorite football team was Randy Moss. So over the past decade and a half, The Informer has liked the Minnesota Vikings, New England Patriots, Oakland Raiders, Tennessee Titans, Minnesota again, and finally the San Francisco 49ers. Naturally, since The Informer likes players, not teams, it was going to be pretty hard for him to write about his favorite teams' uniform. Luckily before giving up on writing about uniforms, The Informer had an epiphany. He should just write an article about his 25 favorite jerseys ever. So with that in mind, here is The Informer's list of the 25 greatest individual jerseys in the history of sports jerseys. Can you all see why The Informer thinks this is one of the greatest jersey's ever? I mean who doesn't love riling up Yankees fans? Truthfully though, The Informer would wear a #13 Rodriguez jersey with his head held high and his syringes carefully hidden in his pockets. There are a couple of jerseys that would be higher on the list, but since their numbers coincide with the countdown The Informer is going to have to sacrifice the pecking order for efficiency. That is the only reason the Ken Griffey Jr. #24 home Seattle Mariners jersey is not in the Top 10. This is one of the coolest jerseys, for one of the best ball players to ever play the game. The Informer doesn't care who you are, if you want to be respected as a ranker of sports jerseys, then Michael Jordan has to be represented on the list. For The Informer the coolest of all Michael jerseys was the black alternate jersey the Chicago Bulls wore during their 72-10 record breaking season. The Informer either wanted this position to be Walter Payton, or Gale Sayers. In the end Payton wins out because in the original Tecmo Bowl football (For regular Nintendo) Payton was the best player on the game. 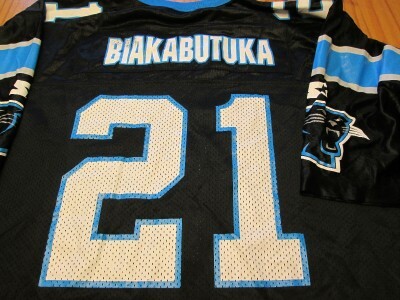 This was The Informer’s favorite jersey in 1996 because the Carolina Panthers had the coolest jerseys at the time and Tim Biakabutuka had the coolest name. No one was cooler than Allen Iverson; hence his jersey has to be on this list. The Informer knows some people are going to be mad (Peta) that The Informer is glorifying a Michael Vick Atlanta Falcons jersey, but seriously look at those sweet colors and tell me you wouldn't rock a Vick #7 jersey. For about three years in the late 1980’s there was no one better than Daryl Strawberry at the game of baseball. If you grew up in the late 80's early 90's you know how cool this jersey is. Other than wanting to share that story, Green is on this list because he is The Informer's favorite player not named Randy Moss. Lawrence Taylor was a bad man whenever he stepped onto the football field. So whoever wears his jersey is naturally transformed into a bad man. At gunpoint The Informer would take Ray Lewis as the best defensive player he has ever watched, but the crack between Taylor and Lewis is very close. Tommie Frazier is still the greatest college football quarterback of all-time. He played in three National Title games, winning two, and when he graduated his 33-3 record was the best off all-time. And yes The Informer is fully aware that he is a huge "Husker Homer." True story, the first jersey The Informer ever bought was Jerry Rice's 1994 San Francisco 49ers jersey. The Informer paid $33 (after taxes) at the local J.C. Penny's to own the #80. 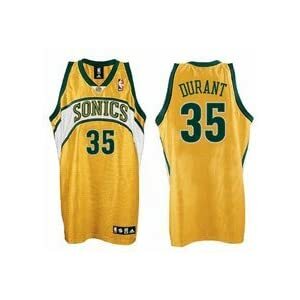 The Informer would be okay if you wanted this to be the #40 Shawn Kemp jersey, but for him the #35 Kevin Durant is the must own Seattle Super Sonics jersey. The Informer kind of wishes the back of the jersey said "QB 12" but the Randall Cunningham Philadelphia Eagles jersey is still a must own. And if you don't understand the "QB 12" reference, then you won't understand why this jersey is on the list. 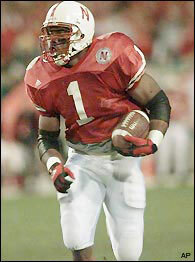 Lawrence Phillips may have been a trouble making bust in the NFL, but in 1995 if you were living in the middle of Nebraska nobody was cooler than #1. Did you know that Barry Sanders rushed for 2,628 yards in his final year at Oklahoma State? For those scoring at home that is still an NCAA record. You can take your pick between the home white, the Orlando Magic blue or the black jersey, it does not matter. If you owned a “Penny” jersey in my neighborhood than you had serious street cred. Before the “Black Mamba” or “Vino” you simply had the best 22-year old basketball player ever. Jalen Rose's philosophy is to give the people what they want. Well in 1993 the people wanted the Jalen Rose #5 Michigan Wolverines jersey. The best part of of buying the Rose jersey is you could also buy the matching shorts to make an entire Rose outfit. Of course the shorts and jersey only came in one size --Extra baggy. The Informer swears he is not just putting a Ray Lewis jersey in the top 10 out of fear. While it is true that The Informer is scared to death and deer urine of Ray, this jersey also happens to be one of the coolest of all-time so it has to be on the list. Oh the good old days when the baby blue Kansas City Royals jersey was something to be proud of. The Informer may be alone, but Joe Forte’s #40 jersey is the coolest North Carolina jersey a person can ever own.The Informer has actually owned this jersey (And had stolen) two separate times. The 1994 Deion Sanders 49ers jersey is hands down the best jersey "Prime-Time" wore during his NFL career. For those that don't know, in 1994 Sanders signed a one year contract with the 49ers that resulted in “Neon-Deion” winning his first of two Super Bowl rings. Los Angeles Raiders sliver and black mixed with the greatest athlete to ever play professional football. If the next guy had never played football, then Bo Jackson would be number one on this list. If The Informer were being honest, which we all know he loves to do, he would have to tell everyone that this initial list of 25 actually included 33 different Randy Moss jerseys. However, The Informer was told that in order to write this article he would have to add some diversity. Just so you know, being told he has to have some diversity to his list is the only reason there is only one Moss jersey on this list. As for the selection; since there are so many great Moss jersey's to chose from, The Informer decided to keep it basic and go with the jersey that started it all --the #88 Marshal Thundering Herd. Now if you will excuse me, The Informer is going to spend the next four days on Ebay buying jerseys. I didn't know the freaking Bengals had a better jersey than the Celtics! ow could you put an A-Rod jersey in there but not a Larry Bird???? Have you ever seen a Larry Bird jersey? I love the guy but 1980's Celtics jerseys were really out dated...And Brendan Larry Johnson's #2 was right on the fence . . . If I didnt want to tell my wifes AJ Green story Grandma Ma would have made the list. Celtics jerseys aren't that cool but if we are talking jerseys how are is LJ not on the list? I respect that though.